Investors piled into technology giants such as Amazon, Alphabet and Microsoft on Friday, driving the tech-heavy Nasdaq to one of its biggest one-day jumps this year. The gains came after the firms’ quarterly results blew past forecasts. The Nasdaq surged 2.2%, adding 144.49 points to close at 6,701.26. 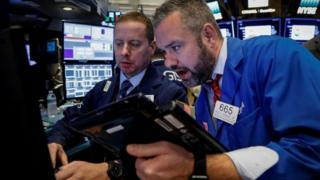 The S&P rose 20.67 points, or 0.8%, to 2,581, while the Dow Jones industrial average rose 33.3 points, or 0.14%, to 23,434.19. US markets have rallied this year, driven in part by a rise in major tech stocks. That had slowed in recent weeks, but accelerated after the earnings reports on Thursday. On Friday, the Commerce Department reported stronger-than-expected 3% growth in the third quarter, adding to market optimism. Shares in Amazon jumped by than 13%, after it said third quarter sales increased 34% to $43.7bn. Alphabet shares jumped more than 4% after the firm said third quarter revenue climbed 24% to $27.8 billion. Apple was also higher after it said sales of its newest phone were strong. This followed recent reports that sales had been sluggish. The gains masked stumbles for some companies – even in the tech sector. Expedia, for example, plunged by nearly 16% after disappointing investors by saying growth would not be as strong as expected. Expedia is also among the hotel booking sites that will be probed by the UK’s competition watchdog. Ever fancied joining a private members’ club?